BIOREM is a registered PROBIOTIC according to Act 36 of 1947. 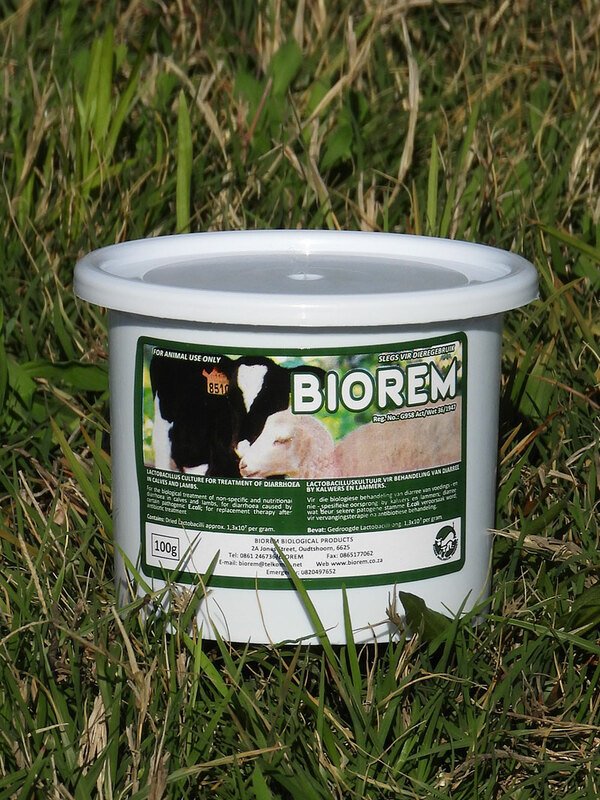 BIOREM contains large quantities of micro-organisms that are cultivated on a Lucerne medium. The product looks like milled lucerne, with a typical sour acetic smell. 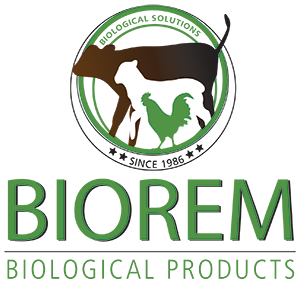 The species of lactic acid bacteria in BIOREM are specifically selected for their ability to multiply under conditions which are usually not very favourable to the conventional micro-organisms in the digestive tract, as well for their antagonism against specific pathogens. WHY IS THE BACTERIA INCUBATED ON LUCERNE (alfalfa)? Reduces the cost of the growth process. It conserves lactic acid bacteria exceptionally long. Acute non-specific diarrhoea in calves and lambs can be treated more effectively with the dried product. The undeveloped rumen, which is frequently the source of infection, can be reached more easily. Dry food goes directly to the rumen. It is completely safe and it does not contaminate the environment with chemical materials and antibiotic resistant organisms. a). Preventative: 4g stirred in the calf’s milk and 1g for Iambs, daily. b). Acute diarrhoea: place a double dose of 8g (two desert spoons) two to three times per day dry on the tongue. Ostrich chicks: General health and chances to survive increases drastically. The product has been registered for ostriches under the name BIOREM-PLUS. Show bird and Pigeon breeders: BIOREM helps to prevent losses during stress situations. The products that have been registered specifically for birds and pigeons are Bi-Avirem and Bi-Avisin. Sheep feedlot: adaptation problems: Sheep start eating earlier, less cases of diarrhoea, fewer animals to be treated in the hospital camp and a saving on the administrating of antibiotics. This product is developed more specifically for feedlots and registered as BIOSIN. 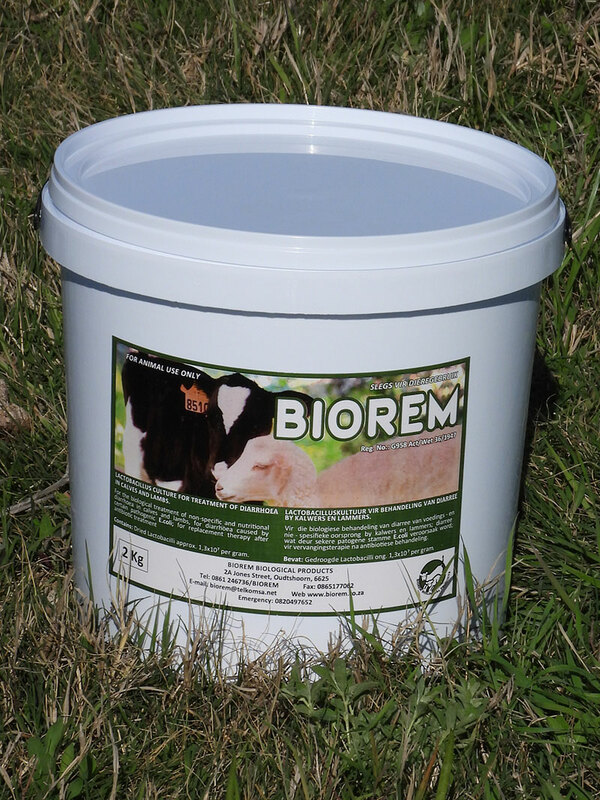 Inclusion rate of BIOREM in the feed at 0.2% m/m, thus 2kg per ton, helps to prevent outbreak of Coccidiosis. Lambs with clinical symptoms of Coccidiosis, could not be cured with the inclusion of BIOREM, but recovered much quicker after specific treatment. The outbreak of Salmonella infection in lambs in a feedlot could be controlled by the inclusion of BIOREM in an experiment. Acidosis could also be treated successfully with BIOREM, while another product, specific registered, failed to get the situation under control. Normally all the bacteria die during acidosis and can be replenished by the BIOREM-culture. 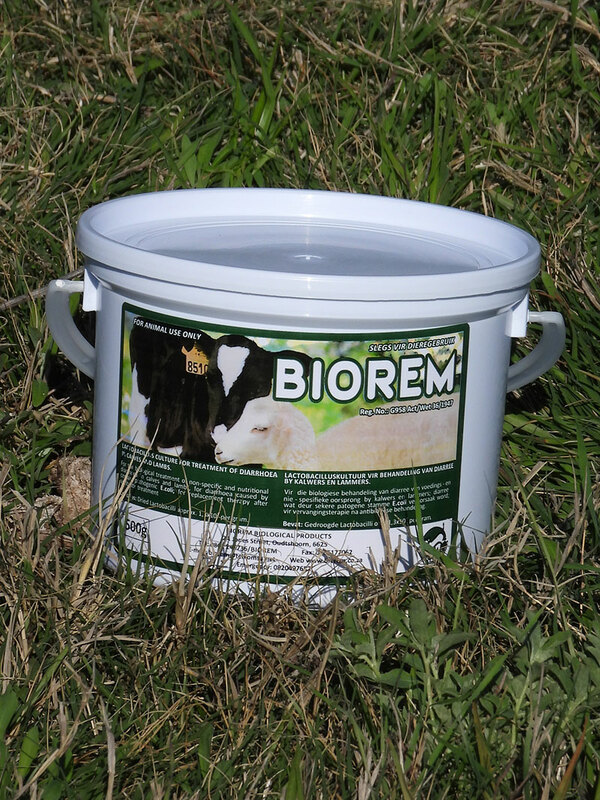 Racing horses: The inclusion of BIOREM in the feed helps to reduce secondary problems that occur as a result of stress. Experiments are currently in progress. Diarrhoea could also be cured in foals with the administrating of the dry product. The inclusion of BIOREM at a level of 0.2% m/m in feed reduced coccidia oocysts and salmonella counts in broilers. Ionophore, included in the feed, did not influence efficiency. The product is registered as BIOREM-PLUS, a powder, and BI-OSTROSIN, a liquid after mixing. The Lactic Acid Bacterial culture in BIOREM starts to multiply rapidly immediately after taken in. The circumstances in the rumen and lower digestive tract are ideal for the growth of these bacteria. The bacteria establish mostly on the mucosa of the digestive tract. Pathogenic micro-organisms present in the digestive tract reduced mainly by ways of competitive exclusion. The population of the ecosystem is brought into balance and an anaerobic situation is established. Bacteriosin, lactic acid, and even natural antibiotics are secretions that help in the reducing of the pathogens. Most pathogens are affectionate to oxygen and the rapid increase of the Lactic Acid Bacteria, change the situation to an anaerobic milieu which is unfavourable to the pathogens and their numbers start to decrease drastically. The result is a healthier animal that does not get sick easily. More technical detail is available on request.